Look 1: How to make a dress usually reserved for evening events, street style-appropriate? Do it like Chiara Ferragni (theblondesalad.com). 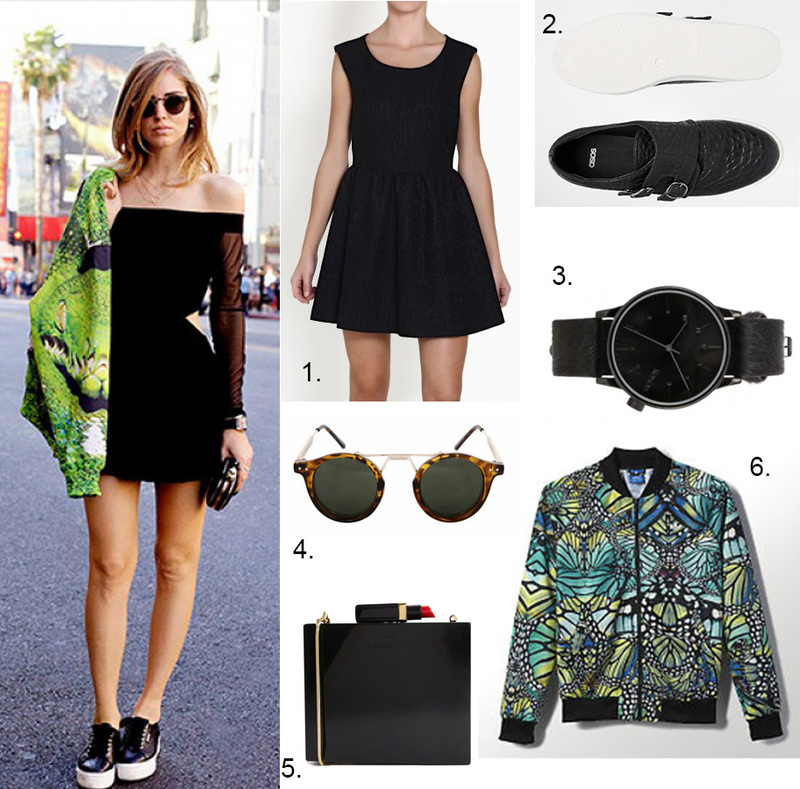 Match your lbd with a printed bomber jacket, a pair of black trainers and your sunnies. 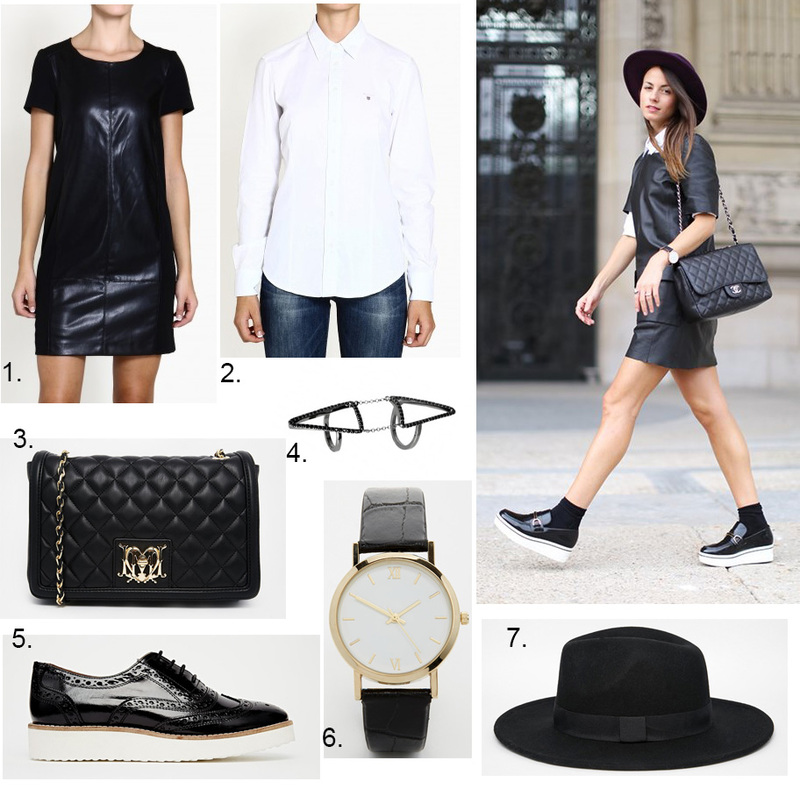 Look 2: Zina Charpakolia from fashionvibe.net preferred a leather lbd and matched it perfectly with a classic white shirt, black loafers with white plimsoles and a fedora hat creating an edgy preppy look. Look 3: Jessica Stain from tuulavintage.com kept it classic and showed us how to make a basic piece of our closet classy and chic. She chose a strapless lbd, a blazer and glamorous strappy sandals and kept her hair and accessories simple. Look 4: Chrysianna Andriopoulou aka Shoprano from shopranoblog.com wore one of my favorite pieces – a cut out lbd and totally rocked it. Chrysianna is known for her love for statement accessories, like armor rings embellished with gemstones and she always wears sets of distinguishing bracelets. For her morning look she styled her lbd with flat Balenciaga buckle boots and switched them with black sandals for her night look. Look 5: Last but not least we will copy Leandra Medine’s grunge look (manrepeller.com). For her outfit she chose a stretch dress with leather details, a plaid shirt and army boots and finished her look with a series of ethnic silver necklaces. Which one is your favorite? How would you style your lbd? Waiting for your thoughts an comments.